President Donald Trump’s overall approach to Saudi jounrnalist Jamal Khashoggi’s disappearance and death is seemingly alienating him from some of his top Republican allies in the Senate. Trump has been criticised for being too “soft” on the Saudis and hasn’t committed to any form of punishment. President Donald Trump’s overall approach to Khashoggi’s disappearance and death is seemingly alienating him from some of his top Republican allies in the Senate. Saudi officials confirmed on Friday night that Khashoggi is dead. Moving forward, Trump will likely find it far more difficult to push his agenda through Congress when it comes to Saudi Arabia, experts say. Key Republican senators, including Lindsey Graham of South Carolina, Marco Rubio of Florida, Rand Paul of Kentucky, and Bob Corker of Tennessee, have all condemned Saudi Arabia over the case and its broader record on human-rights issues. They have been part of bipartisan calls to impose economic sanctions and cease arms sales to Saudi Arabia. Meanwhile, critics feel Trump has been far too “soft” on the Saudis under the current circumstances. Khashoggi disappeared after entering the Saudi Consulate in Istanbul on October 2. Turkish officials alleged that Khashoggi was brutally killed in the consulate under orders from the highest level of the Saudi government. 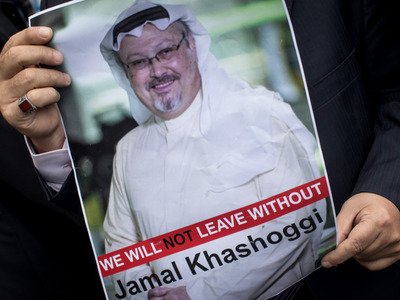 Khashoggi, who was often critical of the Saudi leadership in his reporting, had been writing for The Washington Post and was a US resident with a green card. Early in the case, the Saudis denied any culpability in Khashoggi’s disappearance, and at one point said that the journalist departed the consulate the same day he arrived, without providing proof of that claim. Trump has defended the Saudis, suggesting “rogue killers” were responsible and describing criticism of the kingdom as another case of “guilty until proven innocent.” He’s also touted America’s strategic partnership with Saudi Arabia, boasting about billions of dollars of US arms sales to the kingdom when questioned by reporters about the case. The president on Thursday did say it “certainly looks” like Khashoggi is dead, but stopped short of blaming the Saudi government. He added that there would be “severe consequences” if it turns out the Saudis had anything to do with Khashoggi’s disappearance, but didn’t get into what those might be. Corker, the chairman of the Senate Foreign Relations Committee, recently led a bipartisan group of senators in invoking the Magnitsky Act over the Khashoggi case, which paved the way for sanctions to be leveled against the Saudis. Last week, Corker said he believed the Saudis had killed Khashoggi. More recently, Corker on Thursday decried the Trump administration for its “clampdown” on intelligence regarding the Khashoggi case. The Tennessee Republican claimed a White House official prevented him from viewing intelligence related to the journalist’s disappearance. “I don’t think the administration can allow this to squirrel around too much longer without taking a definitive position,”Corker told Politico. Corker and Trump have butted heads over foreign policy in the past, so his criticism of the White House is not particularly surprising. But the president’s general approach to the Khashoggi case also puts him at odds with three of his key allies: Graham, Rubio, and Paul. The South Carolina senator said the crown prince had Khashoggi “murdered,” adding that he plans to “sanction the hell out of” the Saudis. Rubio said the US will lose its “credibility on human rights” if it doesn’t punish the Saudis, and said the US government shouldn’t be so concerned with money from arms sales. Rubio accused Saudi Arabia of going “gangster on a writer” and being “disrespectful” to Republicans who’ve championed their interests, including Trump. Paul, who’s often been at odds with the GOP establishment on foreign policy, has long decried the US-Saudi partnership. He’s ramped up this criticism since Khashoggi went missing. Brian McKeon, a former National Security Council chief of staff under former President Barack Obama, said it’s “not clear” the Trump administration “understands” how the president’s handling of the Khashoggi case could negatively impact his relationships on the Hill. “It looks to me like the Trump administration is trying to manage the problem rather than engage in a search for the truth,” McKeon, who is now a senior director at the Penn Biden Center for Diplomacy & Global Engagement, told Business Insider. McKeon said the situation could have a “significant impact” on the US-Saudi relationship, particularly in the short-term. “There’ll likely be a reaction” in Congress if Trump chooses not to act against the kingdom, McKeon said.